The Central Park SummerStage in New York City hosts numerous dance, spoken word, and music events throughout the summer. Many of the events are free, although others require advance tickets. SummerStage is an outdoor venue located at Rumsey Playfield (East 72nd Street off Fifth Avenue) inside Central Park. The closest subway is the 6 train to 68th Street. You can easily enter the park on 69th Street and 5th Avenue. Consider bringing the following items to make your time at SummerStage more comfortable. Make note of these items that aren't allowed inside the venue. 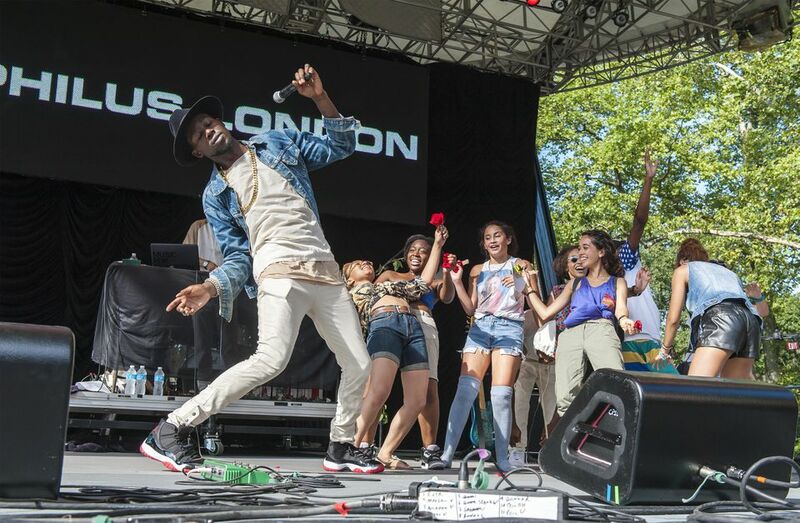 Review these tips to ensure a smooth time at SummerStage events. For more detailed information, visit the SummerStage website. There are no tickets for free events, but space is limited and available on a first-come, first-served basis. For some of the most popular shows, lines form more than an hour before the gates open. There is an open area where many people spread out blankets so they can sit during the show or between sets. There is also bleacher seating, some of which is available to the public. Some bleacher seating is reserved for SummerStage members. If you're attending a show during the daytime, keep in mind that there is little shade, so bringing sunblock and a hat is highly recommended. Also, drink plenty of water to avoid dehydration. Entrance to the Central Park SummerStage area begins one hour before showtime. If you want to get into events more easily, consider purchasing a SummerStage Membership. Members get express entrance to shows, seats on the bleachers, and more. If you're not into battling crowds and are content to just hear the music, there is plenty of space on the grass outside of the Central Park SummerStage area. From there, you can easily hear the concert while lounging on the grass. Concessions including beer, wine, soda, and water are available inside Central Park SummerStage. There are also food vendors if you don't plan to bring a picnic. For special news, updates, and even "skip-the-line" passes follow SummerStage on Facebook, Twitter, Instagram, and Snapchat. Here's the event's lineup of free shows for this summer. Saturday, June 9, 7 p.m.: Bowie Symphonic Ensemble performs David Bowie's "Blackstar"
The following SummerStage shows require a paid ticket. Enjoy free Opera in Central Park! The World's Largest Halloween Celebration is in NYC!